Hi all, and welcome to my first blog post for 2019. I hope you all had a great Xmas and New Year. 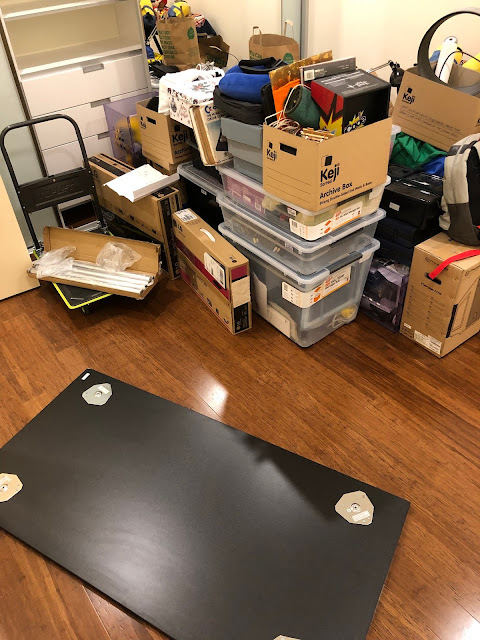 As mentioned in my last blog post in late December 2018, I have been very busy over Xmas and New Year moving house! 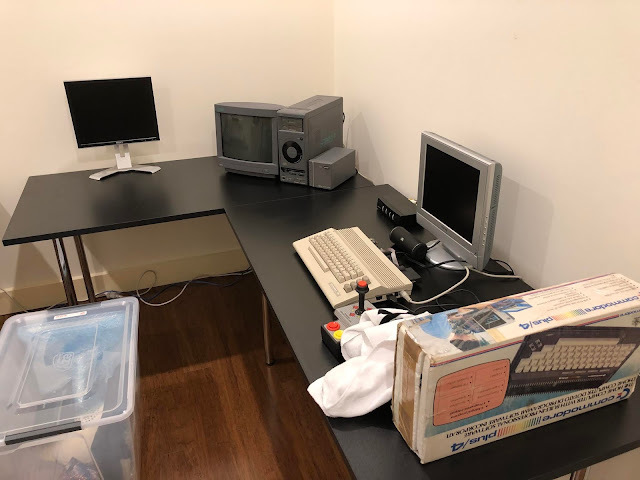 This of course meant packing up all my computers including my beloved Amiga systems (and everything else of course!) and setting up from scratch in a new home. 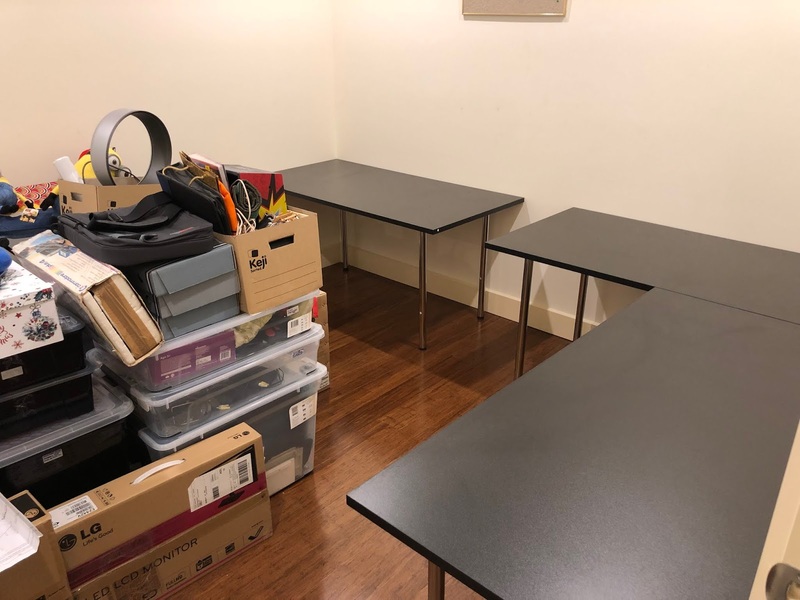 For those who have been through this (packing up an over-full computer room and setting up again), you would know it is a serious amount of work! You have my respect! Looking back at it now I am so amazed I managed to fit everything into this room. Needing to keep a computer running while packing made for some tricky packing but I managed it.. Previously this Ikea cupboard was filled with software and the top of it covered in screens and computers I couldn't set up in the room due to lack of space. 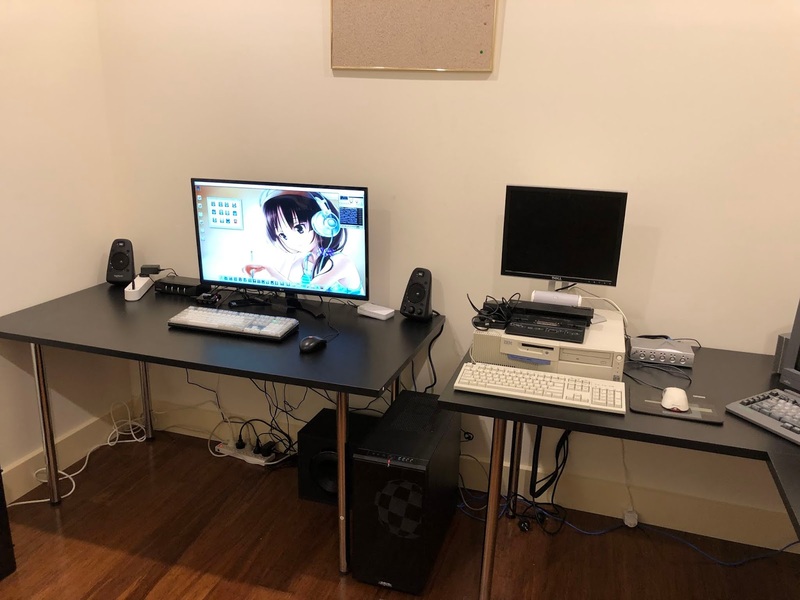 After we moved house and I unpacked the rest of the house, I could then start work on building my new computer rooms in the new house. One of the key criteria of the new place is that it needed more space for my computers, and I certainly have that now! 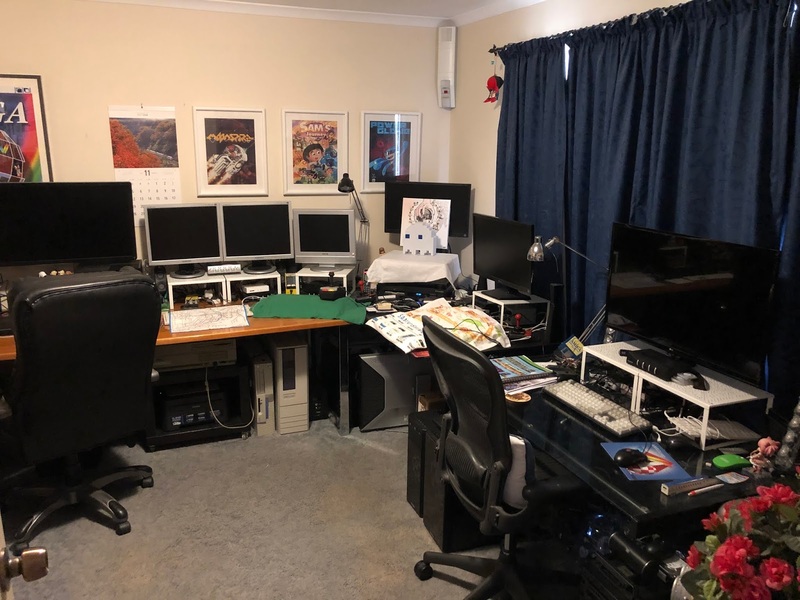 I now have three rooms to work with, each one is the same size as the original room I was using in the old house for everything! 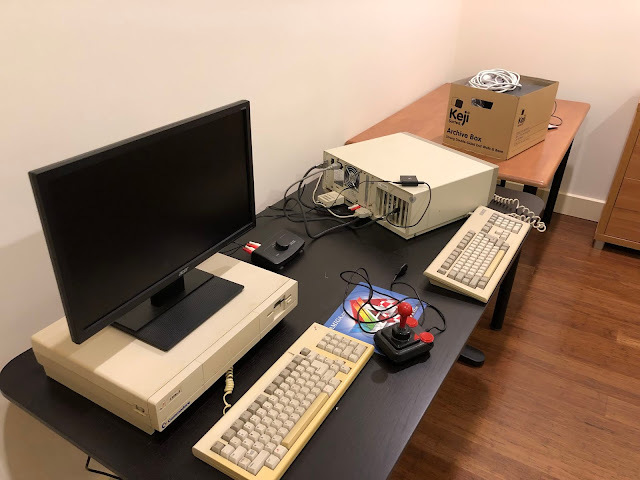 One room is for the modern systems, one exclusively for Classic Amiga systems, and the other for "everything else" including the AmigaOne NG systems. 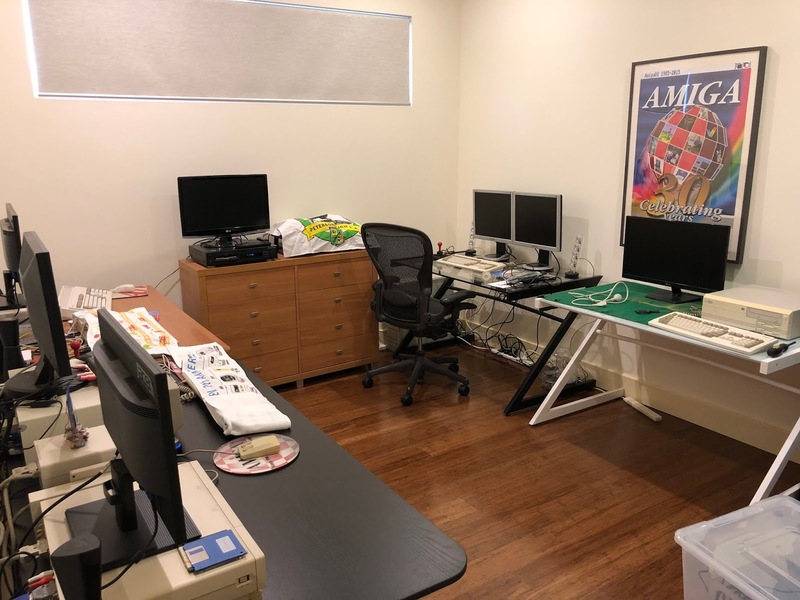 I may move the Amiga NG systems into the modern room depending on space requirements - we'll see. 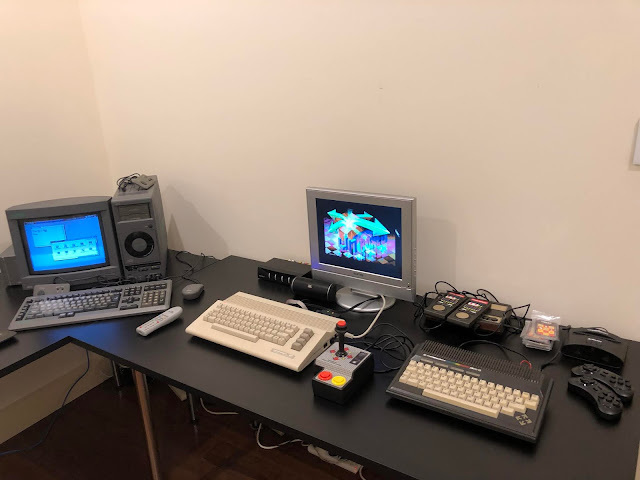 To start with I worked on building the modern room (not pictured). 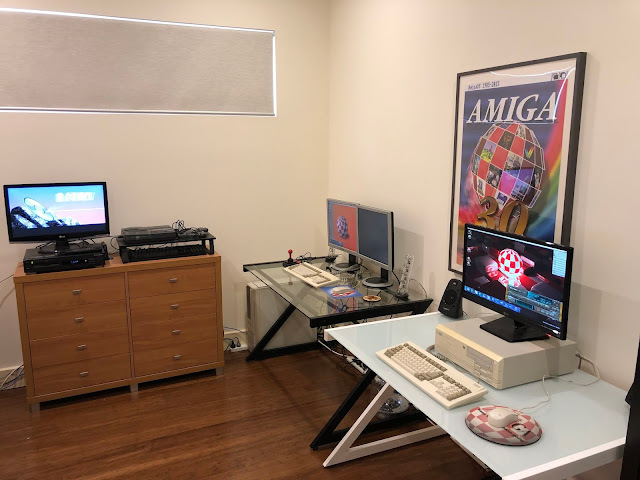 Following that, the Classic Amiga room was next on the list and of most interest for this blog! Some problems presented themselves quickly, like a lack of desks, lack of network connectivity between rooms, lack of power boards and lack of speakers...when they were in one room I needed much less equipment. 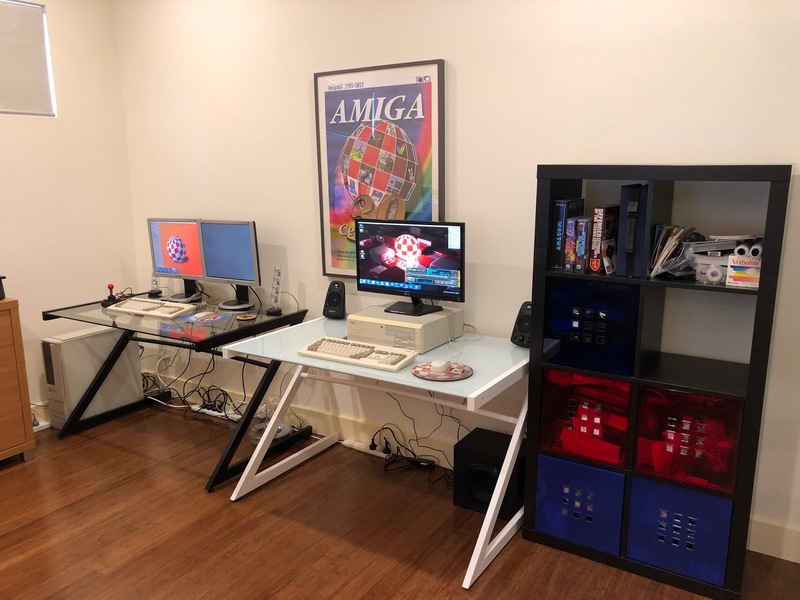 Anyway, I got to work assembling my old desks and disk drawers which I plan to use in the Amiga room. 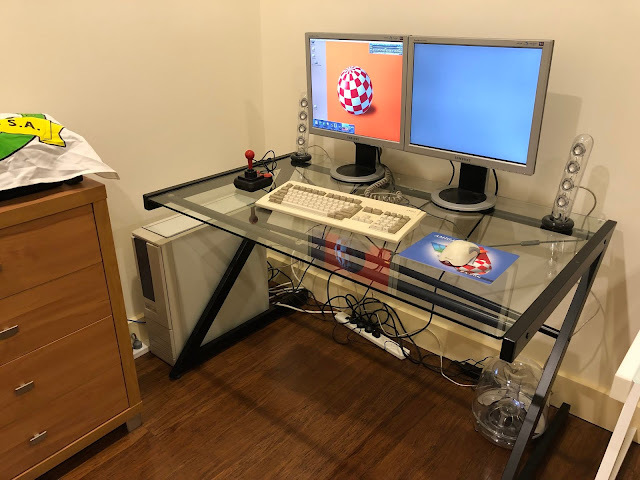 I even found my old dining table during the move and decided to re-use it in the Amiga room to save money on desks since I had to spend quite a bit upfront on this stuff (not to mention the house)! 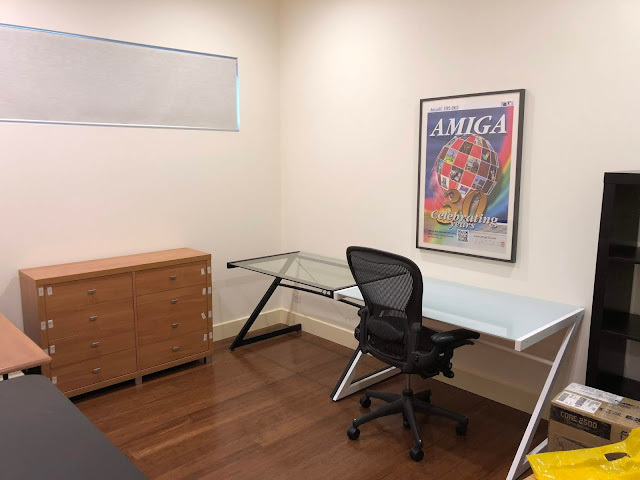 I added my Amiga30 poster to stamp this as an Amiga room, and loaded up my drawers filled with thousands of Amiga floppy disks. 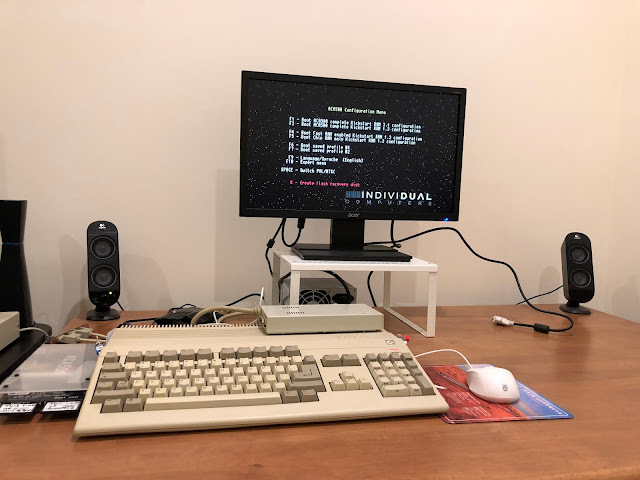 Since my Amiga 1000 had little love in the old place (no room to set it up), I decided to get it running first, along with the Amiga 2000! 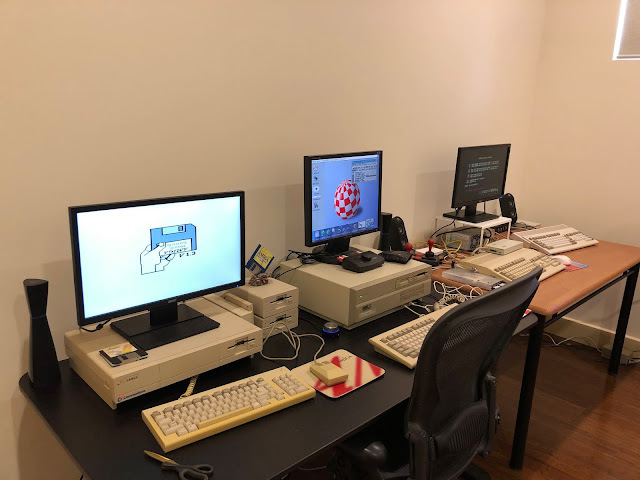 Here is the Amiga 2000 up and running again. Something is wrong with the mouse port though. I can click left and right mouse buttons but the mouse does not move on screen. I tried three different working mice and no go. I can use the manual Amiga mouse workaround on the Workbench screen in the meantime. 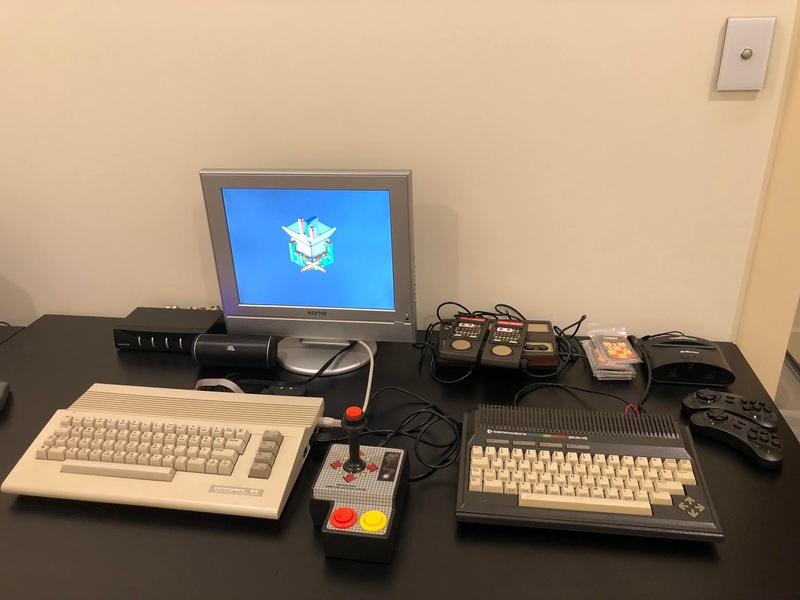 You can do this by holding down the left Amiga key and cursor keys to move it around and LeftAlt+Left Amiga to left click, etc. 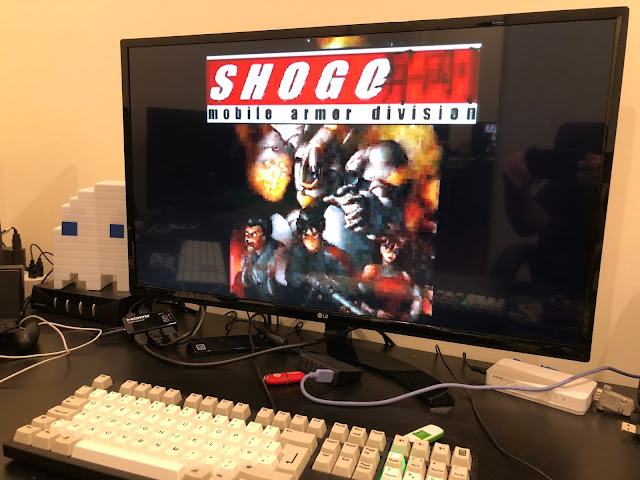 Now is not the time to fix it, so I just got the mod music going on the A2000 and moved on to the next task! Here is the Amiga 1000 and Amiga 2000 running side by side. I added the ram expansions and two external floppy drives to the Amiga 1000. Interesting thing I found while doing this is that the Amiga 1000 wouldn't boot any disks with the external disk drives connected together. 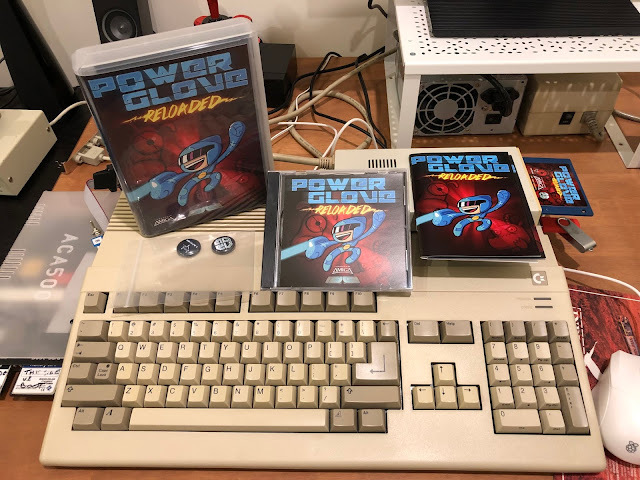 If I connected each drive one at a time to the Amiga 1000 it worked fine! Strange! 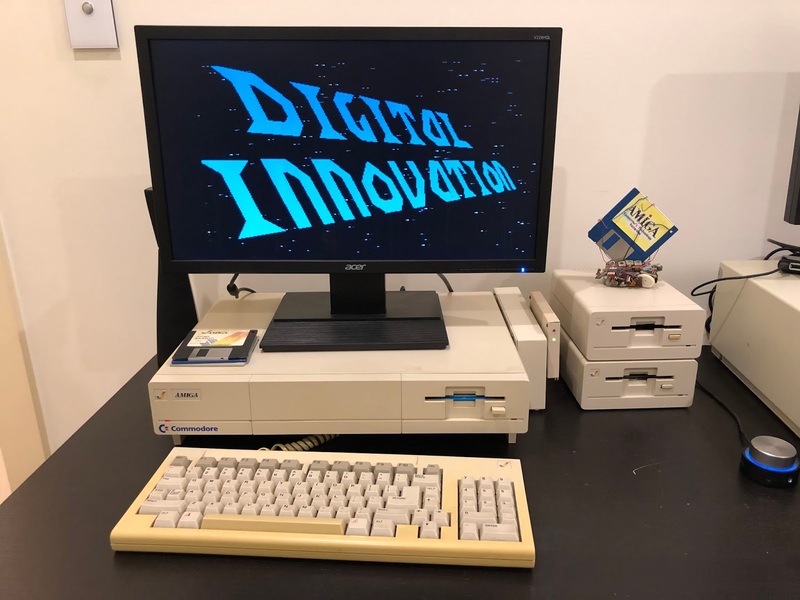 Anyway, I worked out that one of the external floppy drives caused the problem when it was the first external drive. 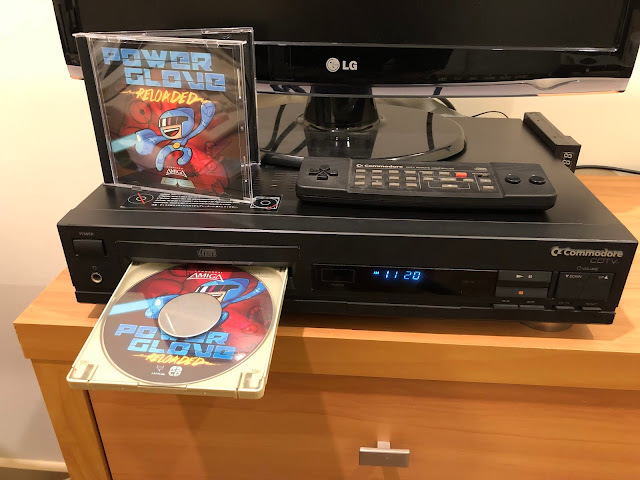 When I changed it so it was the last drive, everything worked fine! Weird, as the Commodore 1010 has no toggle switch for on/off, etc. Anyway, it works now so I am happy with that! The Amiga 500 has been my focus of late with plenty of blog posts recently on my work on it, with the upgrades and AmigaOS 3.1.4 installation covered, amongst others. 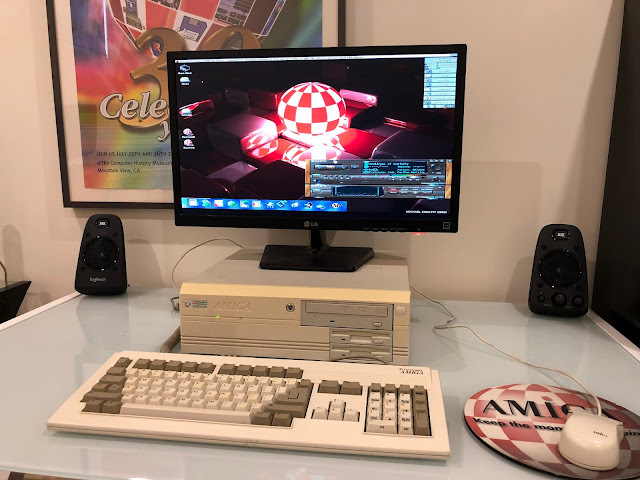 Here it is, the expanded Amiga 500 up and running and working perfectly. 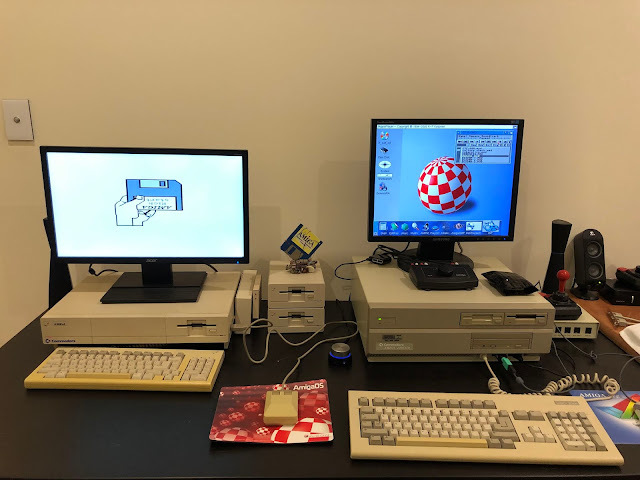 I left some space on the right for the Amiga 1200/Amiga 600. I don't have enough screens for them all right now, so I plan to connected the A1200 via DVI and the A500 via VGA to the two inputs on the screen and switch them as needed in the meantime. One of the reasons for the distraction was the arrival of the recently released boxed Amiga games Powerglove reloaded and Tiger Claw from RGCD for the Amiga 500, CDTV and CD32! 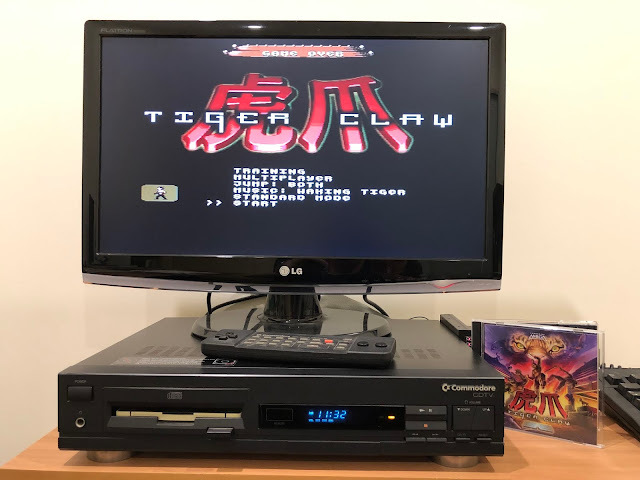 Tiger Claw also has a CDTV/CD32 version included, which I fired up on the CDTV. 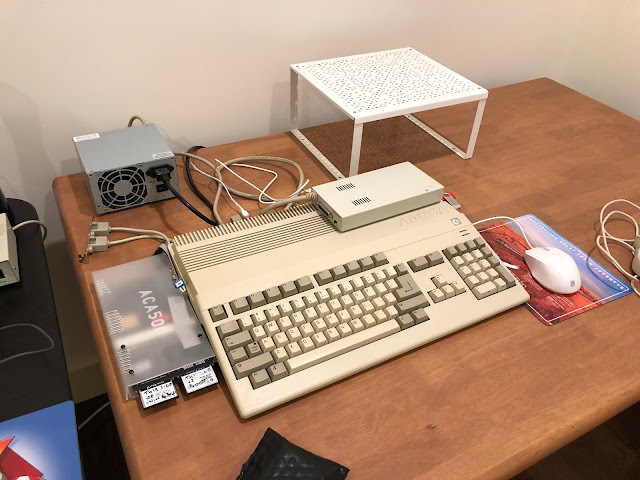 I was going to show a shot from the Amiga 1200 but it appears to have a problem since the last time I used it. It powers on (lights showing) but nothing else. No booting and no insert disk screen. Holding the mouse buttons down on boot yields nothing..I'll have to look at it later. The system is working, but still has a problem with the data partition (SFS) which decided last year to become unreadable! I need to fix this too! 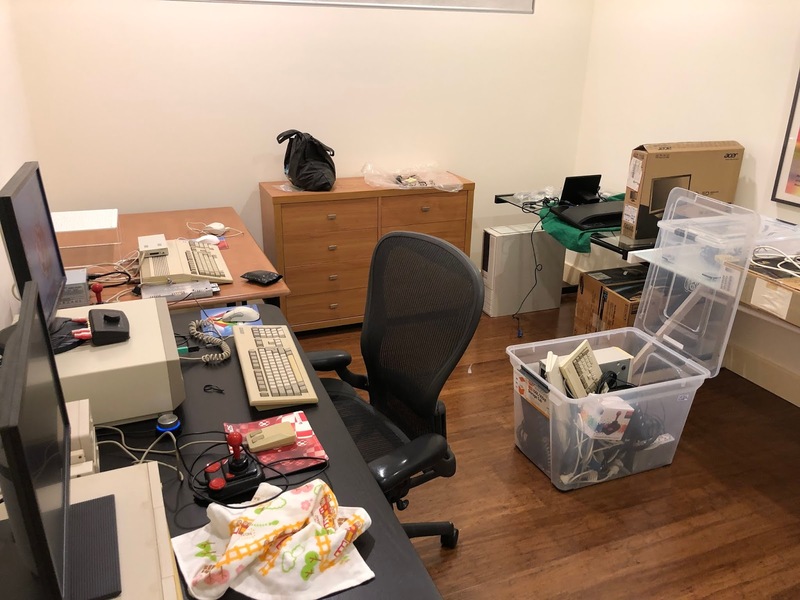 Classic Amigas - everytime you move them you get problems..well, at least for me. YMMV! I am pleased to report it survived storage and the move just fine and works perfectly. 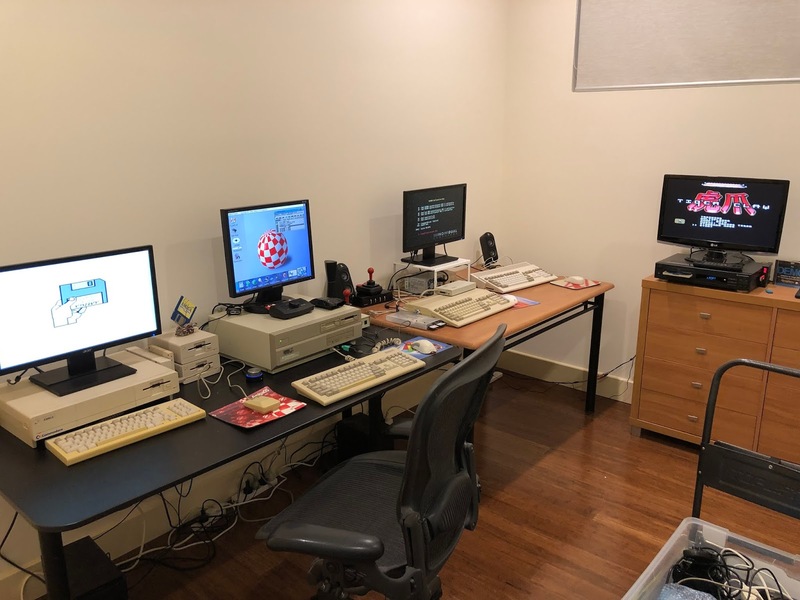 My biggest happiness with the new room is finally being able to use all the Amiga systems at any time, without having to pack up a system, rewire and unpack another one. I realise that many other Amiga people have much bigger and more complete collections than I do, but I am very happy with the systems I have. I am not hunting for any more. I just wanted to be able to use all the ones I have today! 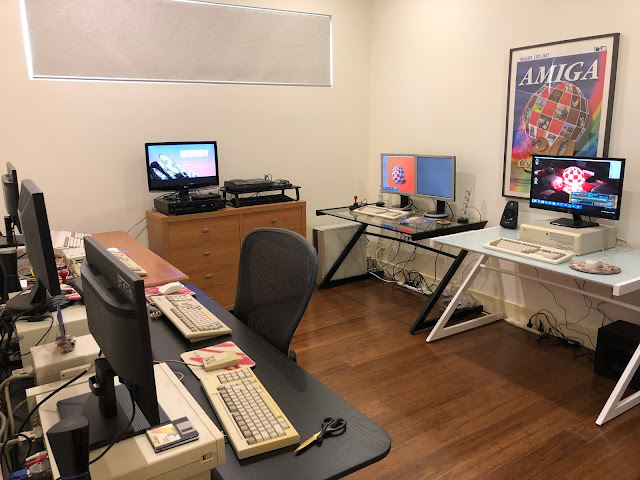 With the Amiga room now done, I turned my attention to the "everything else" room, which includes the NG AmigaOne systems. I used all of my previous desks in the modern room and Amiga room, so I had to buy new desks for the other room. 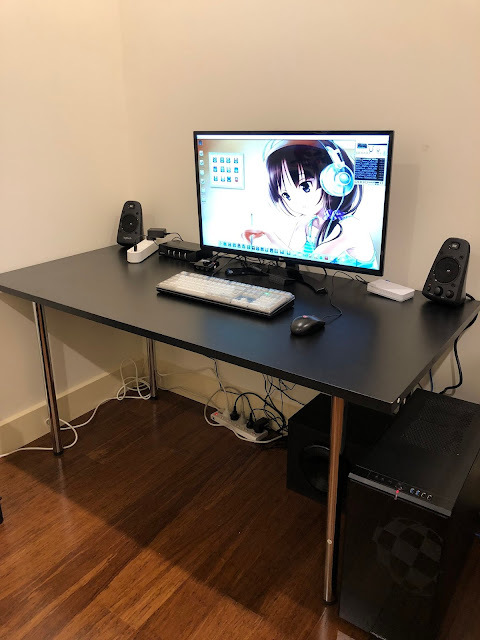 I went cheap for these desks, as I don't need fancy desks - just functional. 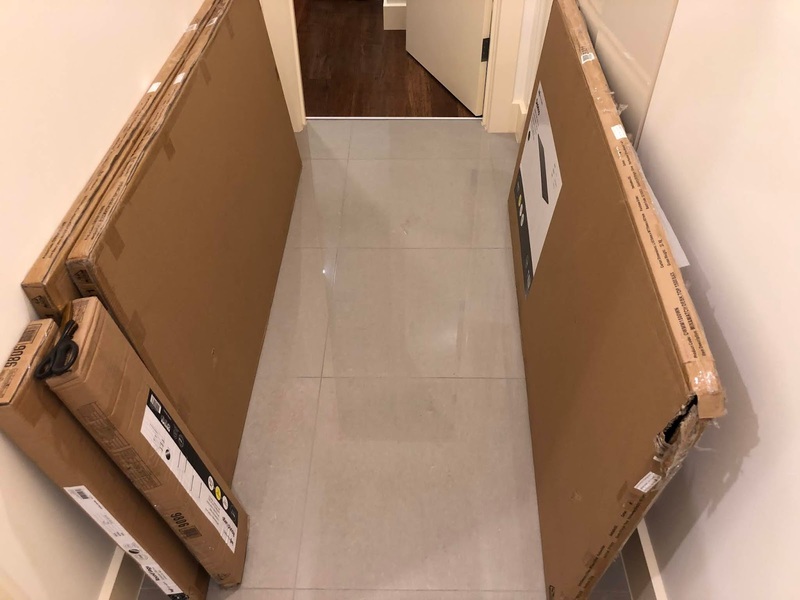 I found these cheapies from Officeworks for under $100 each. I got three to start, but will need more! 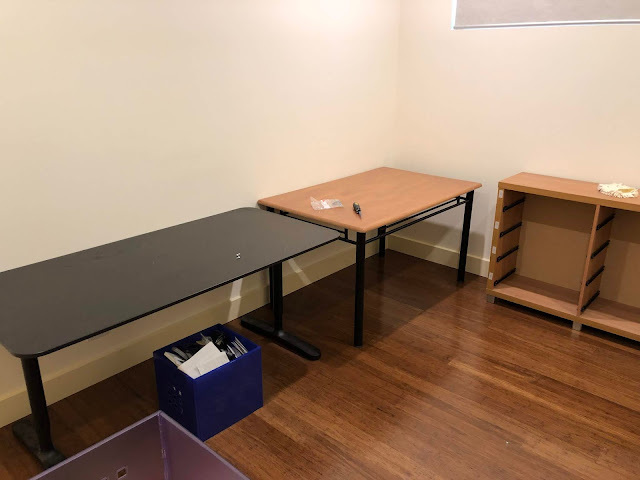 Here are the three desks installed. 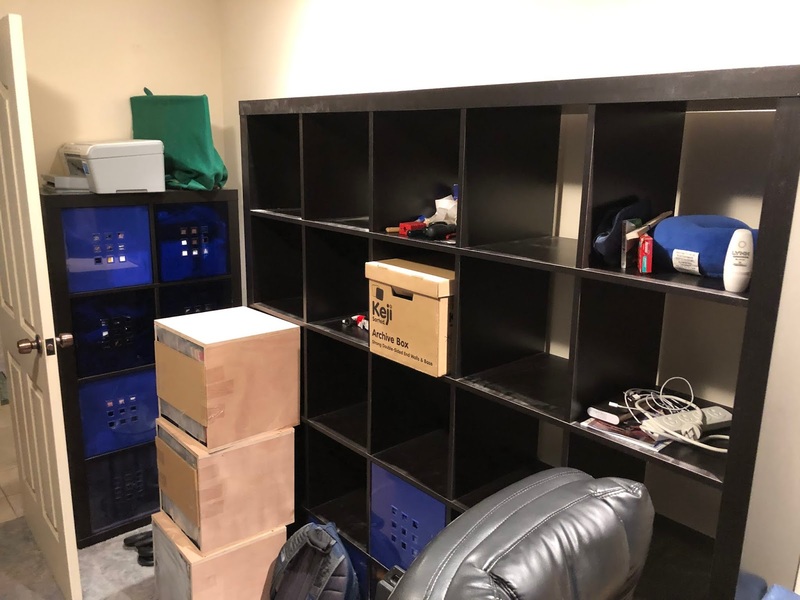 I will add another one later on, but I need to unpack the systems first to make room for it! 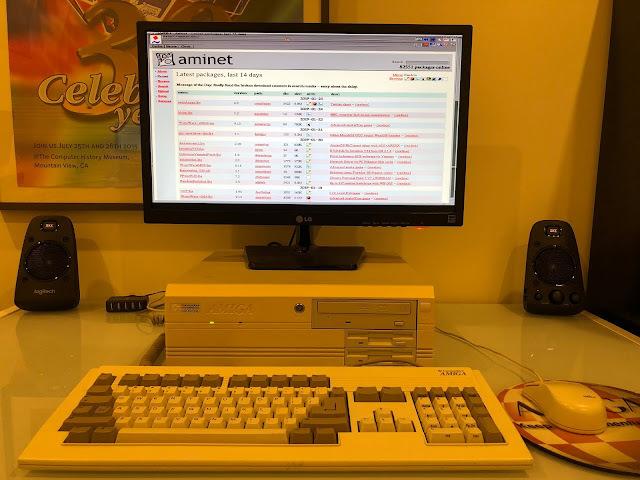 Next up is the AmigaOne X1000. 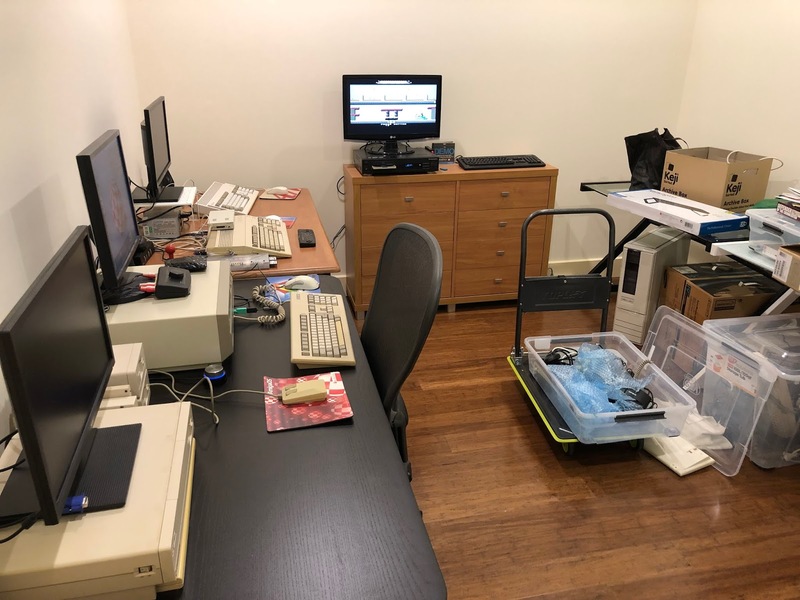 I also started the setup of the IBM Pentium 200MMX PC - as it uses PS/2 my plan to is to use the PS/2 KVM switchbox I was using in the old place to switch between the Minimig, Chameleon64 and IBM PC on it's screen to save some space and also because all of them need PS/2 keyboard and mice to operate and I only have one set of those! 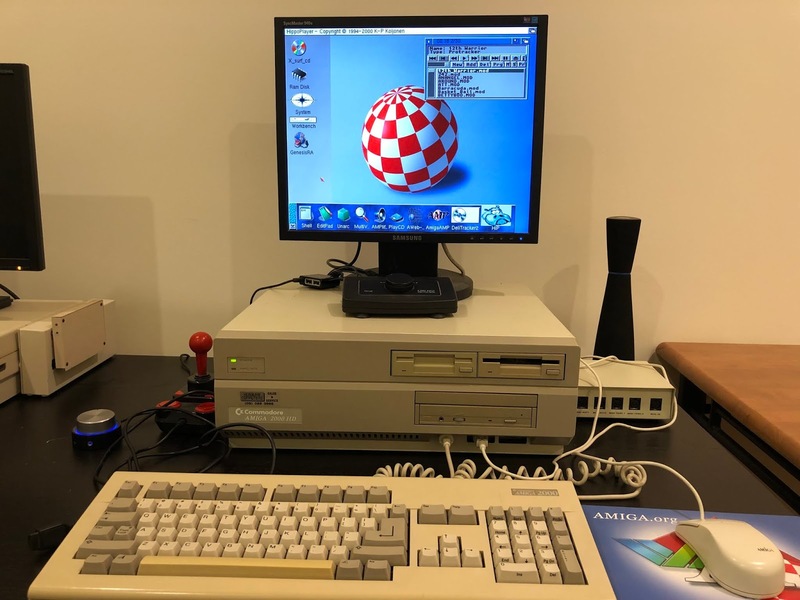 It is great to have the AmigaOne X1000 up and running. 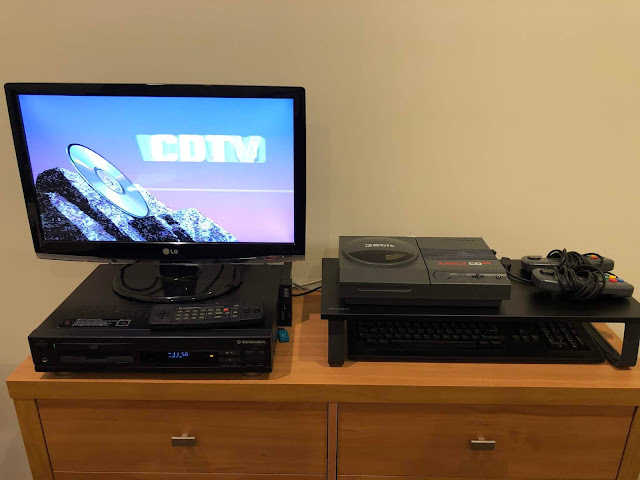 This X1000 setup (like the old place) is using a 5 port HDMI switchbox and audio switcher so I can connect HDMI devices with audio out (like SNES Mini, NES Mini and Switch) to one audio switch and screen, and use the other position for the X1000 and other NG Amigas. 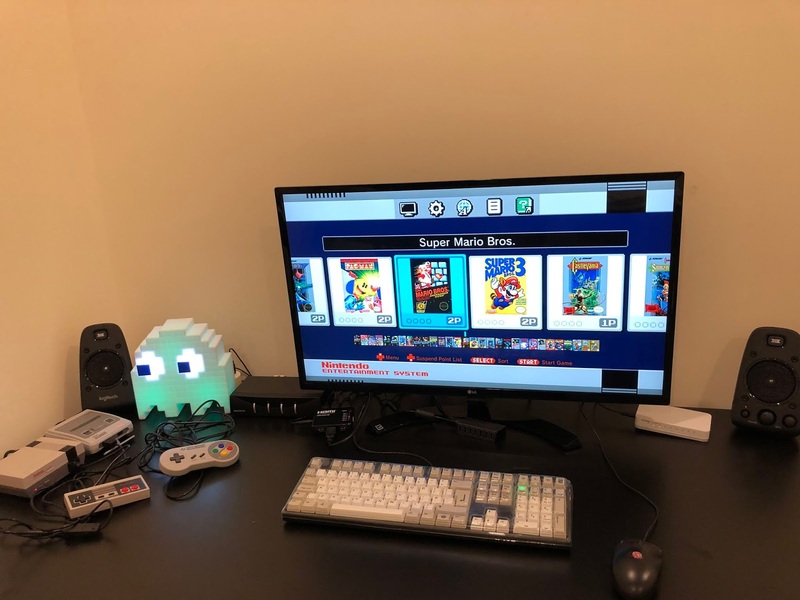 Here is the setup with the SNES Mini and NES Mini installed. I also connected the X1000 via a small network switch to the ethernet over power that goes to the modern room. I added the Nintendo Switch to this as well later on (not shown in photo). 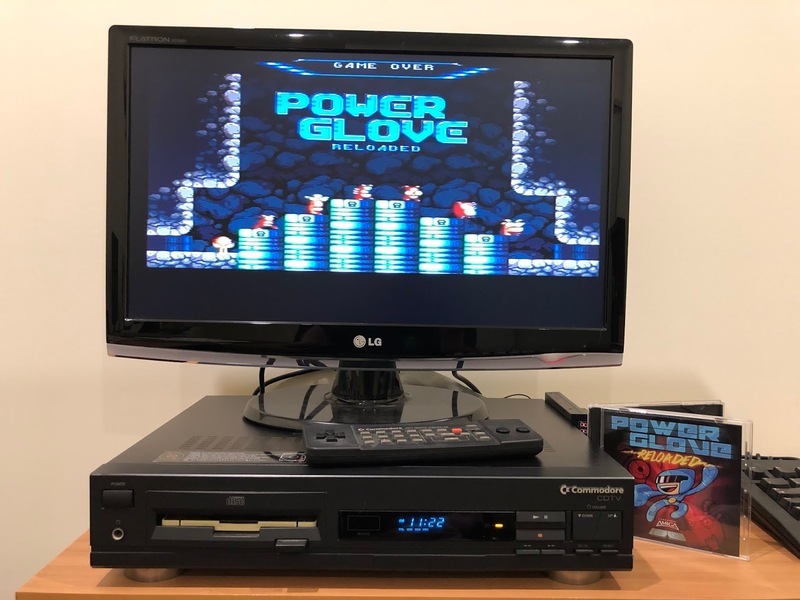 There is plenty of work still to be done but I wanted to get a blog post out in January so you could see what I have been up to - I have been so busy! 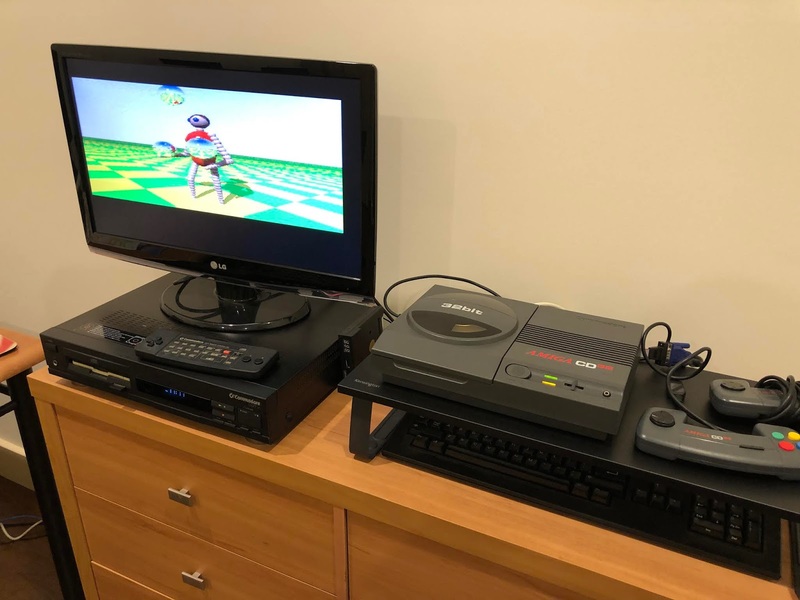 Hopefully things will start to settle down in February as I finish the rooms and can actually do some new stuff with my Amiga systems! Thanks for your patience!